Light hearted, fun and entertaining. This is exactly the kind of chick-lit book I read when I was in my twenties. Now at the ripe old age of 35 I find that I still enjoy a humorous romp through the romantic entanglements of free spirited, adventurous and responsibility free singletons looking for the next love interest. The humour running through the book kept me entertained. I got a real sense of who Chloe was and it was obvious from the first chapter in which direction her relationship with Scott was going to end. Although it made a very entertaining read it took half of the book to get there. I felt that I knew more about Scott than I did about Jean-Luc. I found that I could relate to Chloe in some ways- the nutty siblings, parent woes, alcohol infused shenanigans and the inevitable hangover, the awful first dates, the endless wedding talk that goes on for a year before the event, even the ex in the bridal party was a familiar addition. Chloe seems to get through all of these tribulations with elegance and wit along with the help of a few cocktails. From the romance angle everything happens very quickly. Both Chloe and Jean-Luc jump from being friends to lovers in record time. Event the reader is privy to Chloe's thoughts and we know that she fancies the pants off Jean-Luc we never really see that initial spark and mutual attraction between them grow. I would have liked to see Jean-Luc grapple with the dilemma of being attracted to Chloe and having a girlfriend at the same time. But as Chloe quite frequently points out, he is French and that's what they do so maybe it wasn't really a dilemma at all. Although I lament the lack of depth I find that it is quite realistic in a way. Neither confess instant love for each other and there isn't a whirlwind wedding at the end. And when I think about it I'd quite easily hop from a guy like Scott to a new relationship with a ridiculously good looking French guy (or even a moderately good looking Inishowen guy who isn't an eejit). After all what more could a girl want? 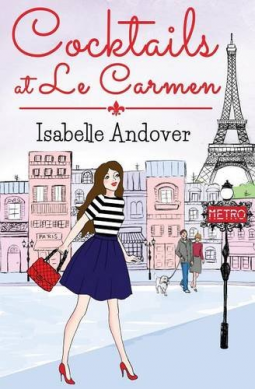 There is plenty of scope for a sequel and I hope the author, Isabelle Andover, has plans to continue with Chloe and Jean-Luc's story. Her writing style flows seamlessly and is sharp and witty. Cocktails at Le Carmen is available in both print and ebook formats.